Happy New Year! Once again, I’m finding inspiration from our trip to Paris. While waiting to check into our Airbnb flat on Ile St. Louis we ate brunch at a place on the tip of the island called Café St Regis. I had a ridiculously fluffy omelet and Cheryl had a buckwheat crepe with ham, cheese and egg. It looked so simple I made a mental note to give it a try at some point. Today was that point. In doing my research about buckwheat crepes I discovered crepes made with buckwheat flour are not actually called crepes, they are called galettes. Furthermore a galette with egg ham and cheese inside called galette complète. Even though I’d never even made regular crepes before, the galettes were pretty easy to make. I found a simple yet sound recipe for them by David Lebovitz, probably THE American-in-Paris food guy. Make a batter, let it sit overnight, then cook in a pan or on a griddle. Just like pancakes, the first one didn’t come out right but by the third one I had gotten the hang of it. Once you get going they start flying out of the pan. I pre-made the galettes the day before and saved them in a bag in the fridge. I soooo wanted to use some of the speck I’ve got curing in the basement but alas it’s not quite ready yet so the last bit of Christmas ham got used up. 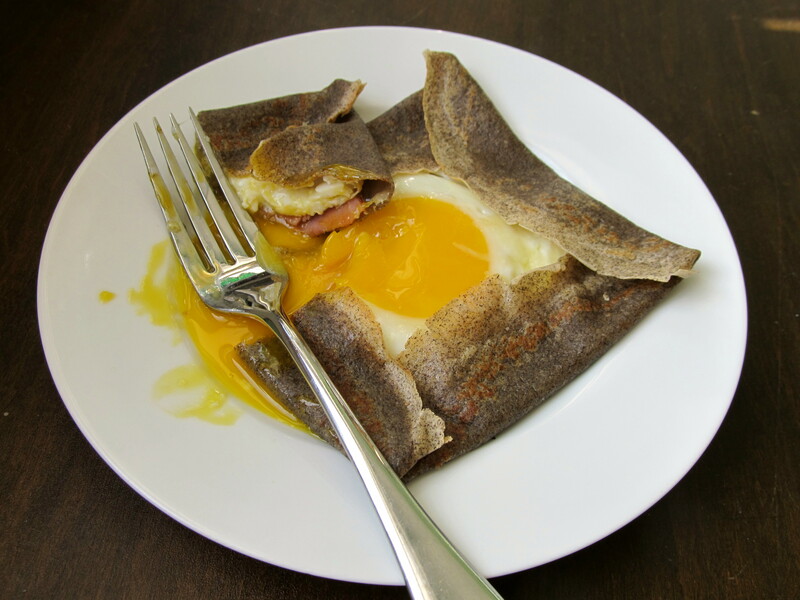 Initially my thought on making these was to make the galette, add the ham and cheese, the put a fried egg on top, basically just reconstructing everything from memory. But everything I read about a galette complete said the egg was supposed to be cooked on top of the ham which was sitting on the galette. Ah the French and their technique. Armed with 15 galettes I figured it wouldn’t hurt to try. Hey the crepes weren’t difficult, so why shouldn’t this part be just as easy? Umm….let’s just say it’s good I had a stack of the thin pancakes. I don’t know if I needed smaller eggs (used large) or the pan wasn’t hot enough, but the egg was taking forever to set and the galette became so crispy I couldn’t fold the edges over. I spread out the egg white in order to make it thinner and help it cook faster but that didn’t work. I even tried putting a cover on the pan to help speed things up. Nope. I don’t know if you need bigger sized galettes in order to really spread the egg around, or smaller eggs, or cook the egg on a fresh galette you just flipped over. It was vexing. In the end I reverted back to my original plan of frying the egg separately and placing it and some cheese on top of the galette and ham which I was heating up on griddle. I know, it’s not proper technique but it was a lot less frustrating and the egg was cooked. Regardless, they tasted delicious and were a pretty good way to start the new year! PS – Yes, I realize I’m on a bit of a French cuisine kick here. These things happen when you spend some time in a fantastic food city like Paris and get inspired! You can’t seriously think I wasn’t coming back from that trip without ideas, right? Mix all of the ingredients together. Whisk or blend until smooth and refrigerate overnight. When ready to make the galettes take the batter out of the refrigerator and allow to warm up for an hour on the counter. Heat a 9inch non-stick pan/griddle over medium heat on the stove. Add a small amount of butter or vegetable oil (about ½ tsp) to the pan and coat with a paper towel. The flour will have settled to the bottom overnight so give it a good whisking before using it. Take ¼ C of the batter and pour into the center of the pan. Quickly tilt and tip the pan in a circular motion in order to coat the bottom. You should end up with a thin coating. Cook the galette for about a minute, you’ll know when it’s ready to be flipped because the edges will start to crisp up. Using a rubber spatula peel up an edge, grab with your fingers and flip it over. You can also use the spatula if you feel you may burn your fingers. Cook for another 30 seconds or so, remove from pan and set aside on a plate. Repeat until all the batter is used. The Lebovitz recipe says it’s good for 18-20 but I ended up with 15. Ok 15 ½ but I ate that one. You can either keep them warm in the oven if you’re using immediately or store in a Ziploc bag in the fridge for a couple of days. Heat a pan over medium heat on the stove. Place a galette in the pan (light colored side down) and heat for a minute. Flip the galette over in the pan, add the ham, crack the egg on top of the ham and spread some cheese around the edge. Cook until the egg starts to set and the cheese begins to melt. Fold the edges of the galette in so it takes the shape of a square with the yolk in the middle. Side Roam: if you can get your egg to set then you’ve done an excellent job! If you’re like me and it just isn’t working so well then just fry the egg separately, heat the galette and ham in a separate pan, then add the cheese and egg, fold the edges over when the cheese starts to melt. I like that, crepes are a favorite of mine but have never tried buckwheat. Looks delicious with the egg in it. Such a neatly packaged meal. Very neatly packaged! A good breakfast for dinner option too.